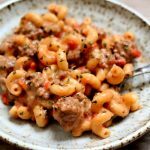 With just a little more effort than making a boxed meal you can have a homemade creamy tomato basil beef pasta meal. And with the help of your Instant Pot it takes just a few minutes. Turn the Instant Pot to the saute setting. When the display says HOT add in the beef. Break it up with a spoon (I use this tool*). Add in the onion. Sprinkle in the salt, pepper, garlic powder and basil. Brown the beef and saute the onion. Once the beef is browned, add in the uncooked pasta. Then pour the broth over the top. Dump the canned tomatoes over the top. Don’t stir. Cover the pot and secure the lid. Make sure the valve is set to sealing. Set the manual/pressure cook button to 3 minutes. Once the time is up let the pressure release naturally for 5 minutes and then move the valve to venting. Remove the lid and stir in the sour cream and mozzarella. If you want to thicken up the sauce you can stir in a cornstarch slurry (stir the cornstarch and milk together until smooth and then stir it into the pot). Salt and pepper to taste. You can easily double this recipe. Just double all the ingredients and keep the cooking time the same. I used 90% lean ground beef so there was no grease to drain off. If you’re using ground beef that’s not quite as lean you may need to drain off some of the grease. You can also use ground turkey for this recipe. To make gluten free: Substitute for gluten free noodles. Check the broth for wheat. Swanson’s Organic Beef Broth says gluten free and no msg right on the front of the box. Reduce the IP cook time by one minute when using GF pasta.